I figured you hadn't read any Easter recaps and that you were chomping at the bit to see exaaaactly how we spent our Easter weekend. Lucky for you, here are 72634937 photos of how we celebrated! 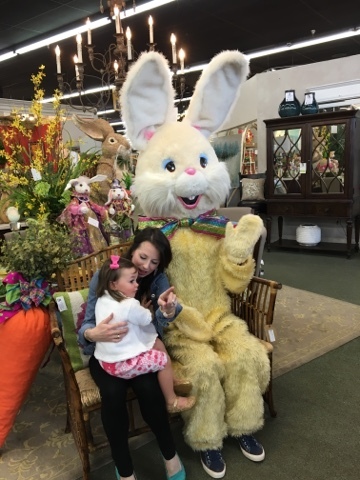 The festivities started out Saturday afternoon when Camille was positively elated to meet the Easter Bunny. Yep, sheer panic. We were close to the front of the line and I have no doubt that after hearing her shrieks of terror, other children probably pulled a U-turn and left the line, fearful of what monster lie ahead of them in line. Later that evening, my mother-in-law came in and we all dyed Easter eggs together! Now THAT was something that Camille really enjoyed. She's been doing this wide-mouthed surprised face recently that we really can't get enough of! We tag-teamed her egg-dipping efforts to make sure that the dye didn't end up on our countertops, clothes, ceilings. We were mostly successful. Sunday morning, Camille got to see all of the goodies that the Easter Bunny ("eesah bobbi") brought her. She got a new Olivia book (because she still begs us to read the Christmas one all.the.time. 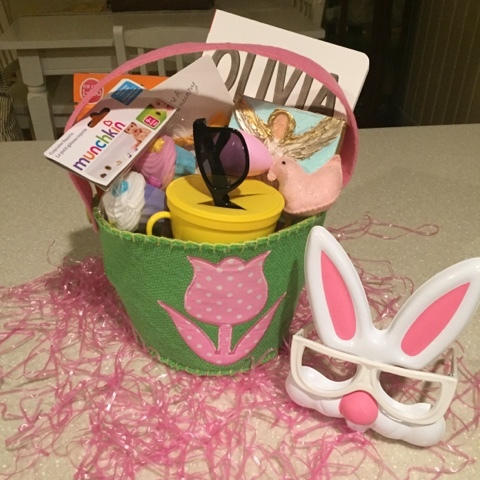 ), yogurt melts, a snack trap, sunglasses, bath toys, a felt peep, a hairbow, and a little piece of art for her room. 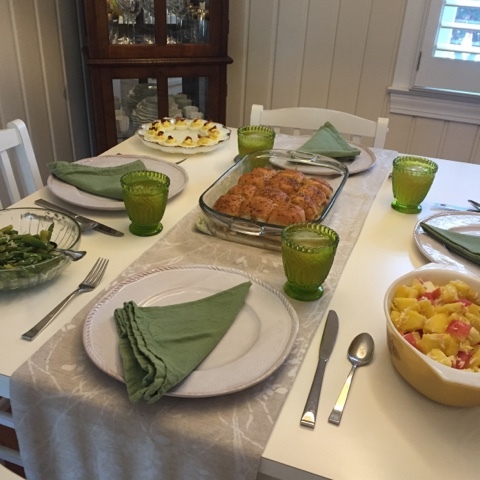 Later that morning, my parents joined us for Easter brunch and the menu was a hit! We had ham delights, fruit salad, cold asparagus salad, veggies with hummus, and deviled eggs. Oh, and a carrot cake which we were too stuffed to touch! My mother-in-law headed to the mountains after brunch, but we did a quick egg hunt while my parents were still in town before Camille took her nap. We were threatened by rain all day, so our Easter Bunny hid the eggs in our screened porch. That adorable dress Camille is wearing was actually made by my mom! I found the fabric this past fall on major clearance and just fell in love with it. It was the perfect, colorful pattern for a sweet Easter dress. So! Last Easter with just our solo little funny bunny. 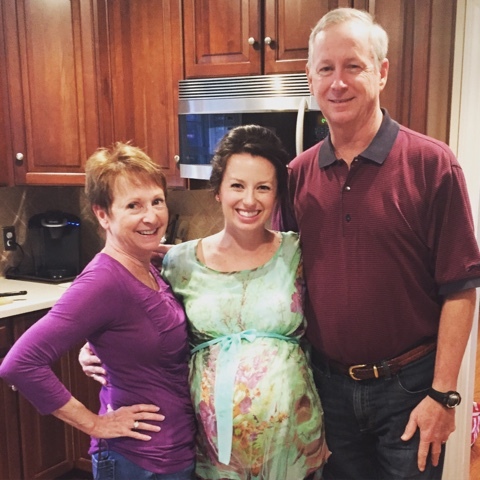 It's crazy to think that next year we will have an almost one-year old son or daughter joining the mix! What a fun Easter! Love camilles dress and you're looking awesome!! Love her sweet little surprised face! Too cute! adorable!! love the sweet dress your mom made!! The fabric is perfect! These pictures are gorgeous! I can't believe your mom made that dress. She's so talented! She is so adorable!! That dress is great - and it's so great that it was handmade by your mom (adds to the sweetness!). Happy Easter! So sweet! You're so close to meeting baby #2!!! What an amazing weekend! And your face in the second picture = priceless. Looks like a fun weekend! 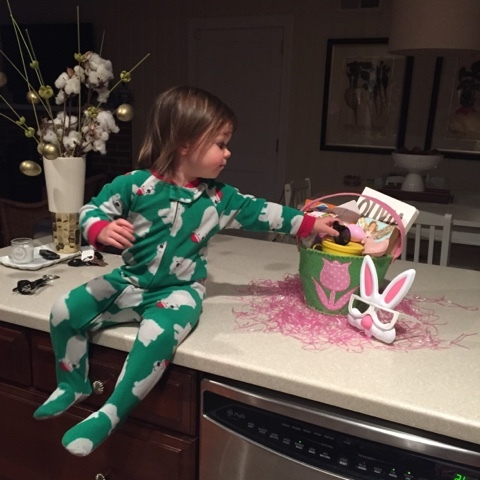 I love the pictures of Camille dying eggs...her surprise face is adorable! You're going to have the baby any day now!! That dress is adorable and so is Camille! My boys made me post notes on the front door and back door letting the EB know that he could leave their treats outside and not set foot inside of our house. ha!! He is pretty creepy if you think about it. Glad y'all had a good one!